KABUL, Afghanistan (CNN) -- A meeting between the leaders of Pakistan and Afghanistan was canceled Friday when bad weather prevented Pakistani President Asif Ali Zardari from traveling to the Afghan capital, Kabul. 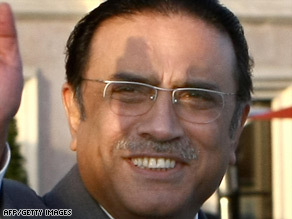 Pakistani President Asif Ali Zardari (pictured) has met Afghan counterpart Hamid Karzai before. An official in Pakistan's Foreign Office said the meeting with Afghan President Hamid Karzai and top government officials will be rescheduled for the near future. The visit was to have taken place amid ongoing warfare and tension along the Afghan-Pakistan border and was to have focused on the nations cooperating in the fight against terror. Some of the Taliban militants conducting attacks in Afghanistan have been based in Pakistan's North West Frontier Province and nearby tribal regions. The group's resurgence has prompted U.S. commanders and the incoming Barack Obama administration to put more of a focus on confronting militants along the volatile border. In the past, Afghan and Pakistani leaders have blamed the other for the security problems in the region. Zardari was to have been accompanied on the trip by the governor of North West Frontier Province, as well as his foreign minister and adviser on internal affairs. The two presidents also planned to discuss the expansion of bilateral relations and trade. Both men have met before, when Karzai visited Pakistan in September to attend Zardari's swearing-in ceremony.